Dichroic glass piece used here also personally made by ME! Also started by making a brick of glass. This piece was also grooved for a simpler wrap design. 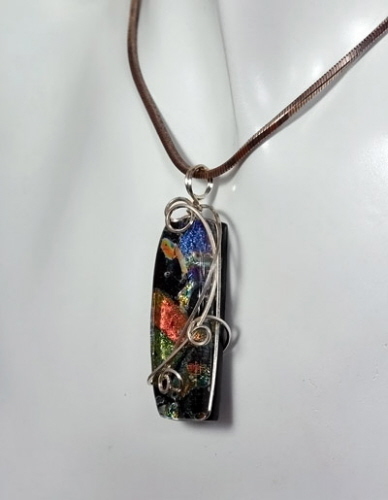 Built on a black background, shades of orange, lime green, purple and blue float within this glass piece. 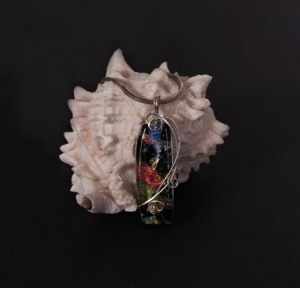 Wrapped in argentium silver wire. Dichroic glass piece measures 39 mm x 14 mm. Finished size of pendant is 50 mm x 19 mm. Weight 0.4 oz.